Outback Battery chargers are available from Christie Engineering . They boast an impressive 80 amp output and have been particularly popular with campers and travellers who don’t usually have access to a source of 240 V power to charge 12 V battery systems. Outback Battery chargers are petrol driven and Australian designed. They weigh 22kg and have a 1.2 litre fuel capacity. They feature a large LED charge indicator light and are powered by a small 100cc Honda four stroke motor. 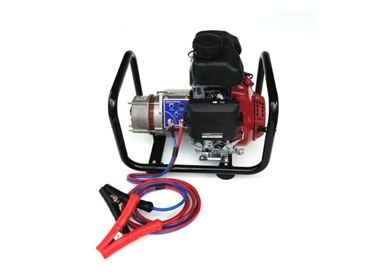 In addition, these battery chargers have an Australian made Bosch 120 amp alternator and two regulated charge rates for low and high output. They have overcharge protection, so there is no risk of destroying the batteries. Outback Battery Chargers can also function as backup generators for 12 V solar power systems and have some more applications for farmers.